POWERED by a 6.4L V8 Hemi engine that pumps out a whopping 344kW of power and 624Nm of torque – the Jeep Grand Cherokee SRT Night is heading for Australia in very limited numbers. Just 120 of these beasts will make their way here, blending a darkened design theme with the staggering performance of the Grand Cherokee SRT. The SRT Night features a host of stealth styling upgrades, including a black grille, lower front fascia and side window surrounds, with the satin-black treatment extending to all exterior badge work. Exclusive to the SRT Night, a set of newly designed lightweight 20-inch alloy wheels – dubbed “5Ten” due to the split five-spoke design – are finished in satin black to match the exterior theme, while also specifically designed to showcase the SRT’s red Brembo brake calipers. The Night theme continues inside, with black Laguna leather interior upholstery with silver accent stitching, complemented by black chrome and anodized silver bezels throughout and to ensure the car sounds as intoxicating inside as it does from the outside, Harman Kardon’s powerful 825-watt, 19-speaker premium audio system is standard. It’s no slouch either, with a 0-100km/h sprint time of just 4.8secs, and a quarter-mile run in the mid 13-second range. 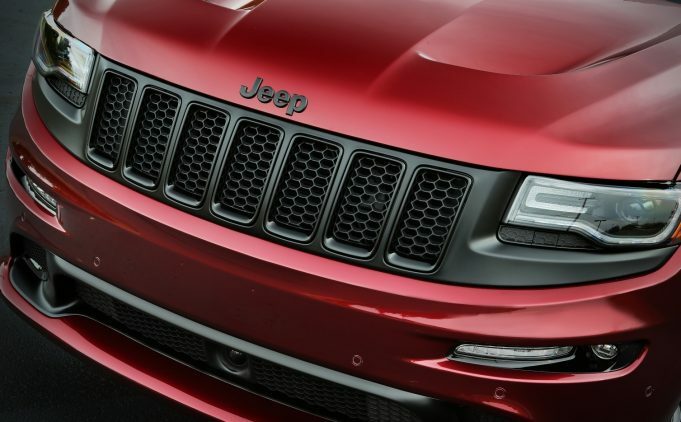 The 2016 Jeep Grand Cherokee SRT Night will land in Australia in June. JAMIE Whincup’s Virgin Australia Supercars Championship win on the weekend didn’t just break the all-time race victory record, but also created a new champion of the cars with Holden’s VF Commodore becoming the most successful model in the sport’s history.